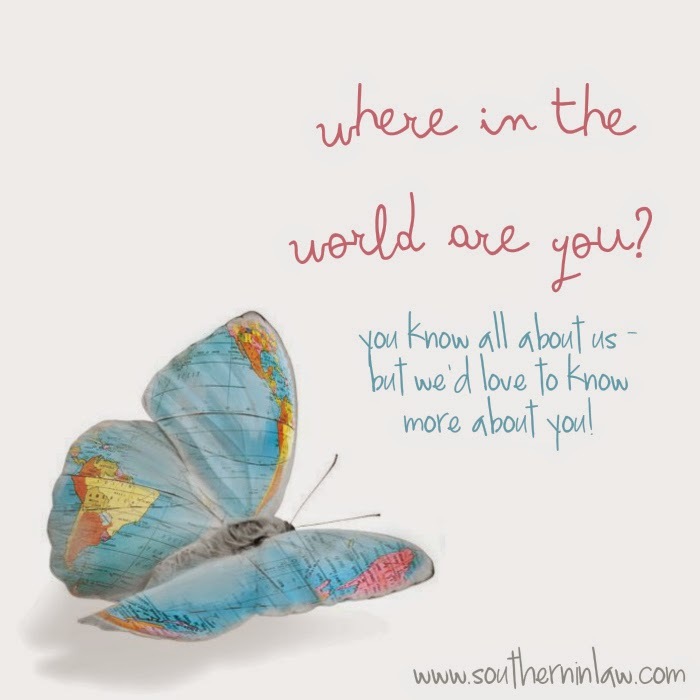 Southern In Law: Where In The World Are YOU?! Where In The World Are YOU?! One thing we love about this blog is that we get to hear from people all over the world who read Southern In-Law! We've seen photos of our recipes made in places all over the globe - from Bali to Alaska and everywhere inbetween. Since you know so much about us, I thought it'd be fun to play a little game to get to know more about you! But in case you're new around here, we'll start. Kristy is from Sydney Australia (where we live today) whilst Jesse is originally from Louisiana USA but also lived in Mississippi (you can read the story of how we met here). Fairy Bread is one food we both associate with Australia however it's also the one food Jesse will not try (because he hates sprinkles - WHO HATES SPRINKLES?!?!!) whilst Jesse links Louisiana with his Nanny's Jambalaya which we have since perfected with slightly altered ingredients here in Australia. Leave a comment below so that we can get to know more about you - you don't even have to sign in, just click "Name" and then select "I'd rather post as guest" underneath! I'm a fellow Aussie (Melbourne) and I have to agree with your fairy bread choice (it's not a kids party unless there's fairy bread!) but I also link Vegemite and cheese sandwiches with my childhood and sausages wrapped in white bread are definitely an aussie food for me! You are so right with the sausages wrapped in white bread - everytime our church has any event on we have a sausage sizzle and I bet it would be totally odd to any foreigner (though Jesse is a converted fan!) haha. Oh yum! Both of those are simple but seriously delicious foods. I am fussy with green beans so I totally get how you could only like your grandma's haha! My mums sponge cakes remind me of my childhood as they were always used as our birthday cake. Also Marmite and chip rolls which I still enjoy!! Love your blog!! Nj <2 But I don't know what I associate with it! haha! I was born and raised in Wyoming! Still living here! I associate any kind of beef meal with WY, but Chicken Fried Steak with mashed potatoes & gravy & corn on the cob are definitely a staple that I associate home with! Magdeburg, now living in Berlin, Germany! For Berlin - kebab! And vegan cakes. Fun! I'm currently in Sacramento, California but originally an East Coaster. I associate tacos with California and Brunswick Stew with Richmond, VA! Hey Corina, thank you so much for taking the time to leave a comment and read our blog! I have to know; hot chips or crunchy chips on your marmite and chip rolls? I also really need to get onto making a healthier sponge cake recipe! Hey there! Thank you so much for reading and taking the time to leave a comment. It sounds like we really need to visit Michigan - we love Farmer's Markets! Haha, it's hard because all of the food you grow up with you consider normal when to an outsider it might be totally new! Yum yum! Summer tomatoes are THE BEST! Chicken fried steak is something Jesse's been trying to get me to make a healthier version of so perhaps I need to do just that! Thanks for reading, Laurie! Thank you for taking the time to leave a comment, Elizabeth! Maple syrup is a staple in our house and sooooooooo delish! I agree! None of the fake stuff for us, here. :) I haven't ever had fairy bread, but I have no aversion to sprinkles, so maybe I should! When you go back to LA, try the thin catfish from Sissy's in Hineston. You will love it! In my opinion it is best with some lemon juice squeezed over it and a few dashes of Louisiana hot sauce. Yum! I know exactly where SIssy's is so I'll have to add that to my to-do list!